Flexible pyeloscopy (or Retrograde Intra Renal Surgery- RIRS) is where a thin lighted telescope is introduced into the kidney from outside the patients without the need for any incision (see diagram). The diameter of the instrument is 2.5mm and allows visualisation of the entire kidney and the ureter due to the flexible nature of the scope. It contains a small instrument port which allows the introduction of a holmium laser fibre (0.2 mm diameter) to efficiently fragment stones, and micro-baskets (less than 1mm wide) to retrieve any stone fragments. Kidney stones up to 2cm in size can be treated using this approach. You will meet your anaesthetist prior to surgery who will take a thorough medical history. This person will be responsible for your safety whilst you are under general anaesthesia. The procedure will usually take 60 to 90 minutes and involves putting a flexible telescope into the drainage tube of the kidney and fragmenting the stone(s) with a holmium laser. A temporary double J ureteric stent may be left in place for a short period to ensure the kidney drains without risk of blockage. It is normal to feel the need to pass urine frequently and notice blood in the urine following surgery. This will settle over the ensuing days. An oral over the counter medication called Ural can reduce the stinging sensation during urination. 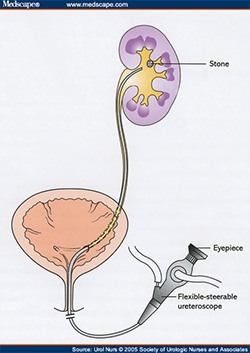 You will sometimes have a temporary ureteric stent(see stent info sheet) following surgery which allows the stone fragments to drain unimpeded. The stent maybe attached to a string tether coming out from the urethra which allows easy removal in the doctor’s office. Care needs to be taken so as not to accidently dislodge the stent by allowing it to get caught up on your underwear. Click here to download Holmium Laser Stone Surgery using Flexible Pyelo- Ureteroscopy info sheet.